Okay, so this dish isn't exactly a baked dish or a dessert. However, the fiance loves this dish and I made it several times and I never even photographed it. So I just had to, and decided to share the recipe with everyone. If you ever ordered salt and pepper pork chops, or salt and pepper shrimp at an asian restaurant, this tastes just like it. Coated in a light dry batter and deep fried. It's actually delicious, despite the deep-fried factor. I hope you enjoy it too. It's a very simple recipe. 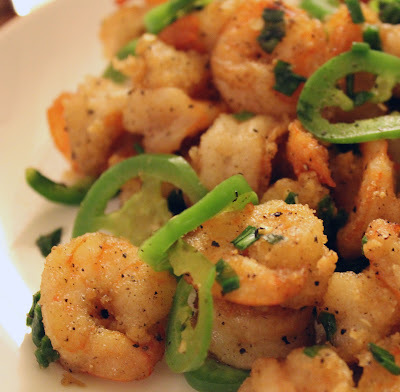 Place shrimp in coating mixture, toss to combine and coat. Heat oil in a pot until 350F. Cook about 5 to 6 shrimps at a time until pink in color. 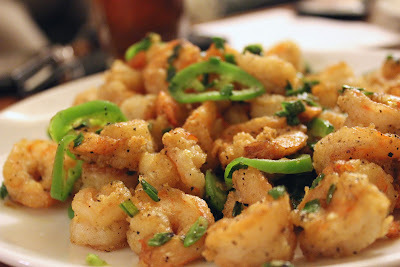 Cook remaining shrimp in batches. Drain off in paper towels. Place some oil in a wok, and heat until hot. Throw in stir-fry mixture (no salt or pepper yet), and stir fry until pungent. Put the shrimp into the work and stir-fry for about 30 seconds. Sprinkle salt and pepper to taste. My fiance invited me to his co-workers house the other night to play tons of boardgames. I volunteered to make cake pops for everyone. I learned a few tricks and tips to making cake pops more easy, since I made tons. 1. Use a styrofoam block to hold the pops after dipping. Attempting to hold it in a cup will make it dry and tilt sideways. Not very pretty. 2. Unless your making cake pops in the hundreds, I recommend melting the chocolate in a cup. A cup wide enough to fit the cake balls easily, and deep enough to cover the entire ball. A double boiler could be used, but I would probably be making hundreds for that method. 3. Dip the stick in some chocolate before pushing it into the ball. Allow it to cool in the refrigerator for at least 10 minutes. This will make dipping so much more easy! 4. While the cake pop is still wet after dipping, sprinkle on some confetti or sprinkles. If you're slow, the chocolate will dry and the sprinkles won't stick. 5. Leave some dipped cake pops blank. You can change chocolate colors afterwards and drizzle pretty lines all around. 6. Put melted chocolate in a piping bag or parchment paper bag and pipe beautiful designs. This gives you more control on how your cake pops will look if you hate drizzles. 7. I like using high cocoa chocolate. It melts better and dips wayyyy better. White chocolate is hard to work with, in my opinion. I would recommend using candy melts for colors pops not in brown and white. 8. Always shake off excess chocolate after dipping. It will dry better. Otherwise the extra chocolate will drip down the stick while drying. 9. If you have a helper, use her/him. After you dip the pop, hand the stick immediately to them. They can do sprinkles or poke it in the styrofoam for you, allowing you more time to dip more pops before the chocolate dries out. 10. If you don't have a cake pop holder to present your cake pops. Consider using the styrofoam block to carry your pops around. You can wrap the block in gift wrapping paper first. OR use mini cupcake liners and put each pop on a liner in a tray. 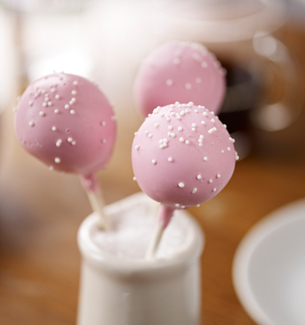 I hope these tips and tricks help you make beautiful cake pops!